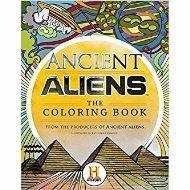 The first official adult coloring book that ties into HISTORY® network's hit series Ancient Aliens®: brimming with forty richly detailed illustrations of ancient artifacts, awe-inspiring archeological locations, and cultural phenomena, Ancient Aliens™: The Coloring Book immerses both the show’s fans and coloring enthusiasts in the wonder of these enigmas. Hundreds of thousands of viewers tune in to HISTORY® network's wildly popular hit show Ancient Aliens®. Introducing viewers to mysterious ancient relics and wondrous archeological sites, the show explores the fascinating unanswered questions about the origins of our civilizations and the possibility of extraterrestrial influence on our cultures and development. The perfect accompaniment to Ancient Aliens®: The Official Companion Book, this authorized coloring book includes intricately detailed illustrations of more than three dozen iconic monuments and objects tied to ancient astronaut theory—from the Great Pyramid of Giza to Mayan artifacts eerily similar to modern astronauts. Ancient Aliens™: The Coloring Book is a must for Ancient Aliens® viewers—and an intriguing introduction to this mind-blowing show for dedicated coloring devotees curious to explore our ancient civilizations in a unique way. Ease away stress and anxiety and explore the fascinating possibility that we are not alone in the universe with this captivating one-of-a-kind coloring book!